Yep, sounds good. Lets go! I rang up and booked straight away. We were sorted to go 22-24 April. Spring Time. We’d spent the past few days putting EVERYTHING together we thought we would need – after all it was just going to be like camping – but with out the tent, well a stone tent. Had the stove, plates, mugs, hipflasks (topped up with whisky), blankets, sleeping bags, mats....etc..etc... I packed lots of layers. What could possibly go wrong. I’d been camping before, I knew the score. We loaded up the car (it seemed awfully full for just two nights away) and set off. It was a damp evening and dusk was falling when we arrived after a 2 hr drive. There was still enough light to see to unlock the gates (you get given codes to get through two sets of gates as Peppercombe is all National Trust owned) and made our way slowly down the uneven tracks to the Bothy. 'Is that the sea there in the background!' I squeaked excitedly as we got closer. Even though it was drizzly and grey you could still see that the little white bothy was in an amazing location. It was overcast and raining when we arrived. We parked up, I got out the car clutching the piece of paper with the code for the Bothy on it. I knew it was going to basic, and that was fine. It was part of the fun, part of the adventure. We started to unpack and set up our beds on the raised platforms at the back of the bothy. There is a fireplace, with a ‘No Fires’ sign boldly on display so I hoped we’d packed enough layers. A sink with running water and a small worktop to put the stove and cook/prep food on. Pretty much all we needed. There was still a bit of light outside but in the bothy we needed to use our torches. There were also some candles on the fire place which I thought was a nice touch, so lit those. It was starting to feel cosy. The bothy has two raised platforms to sleep on and the most luxurious embroidered curtains! Unpacked and fuelled with tea and with the light fading fast we set off on a short explore down the path to the right of the bothy towards the beach. We didn’t get all that far before it became too dark to really see and even with torches decided to head back to cook dinner and have a proper explore in the morning. Some ingenuity was called for to set up the small torches we had which was easy enough and cooking resumed. Should have brought our head torches! I noticed it was starting to get rather cold. We tucked in to a very tasty dinner (pork in a chilli marinade with rice in case you were wondering) and had a glass of red wine. Sitting huddled in the bothy - me trying to keep warm, it wasn't long before we decided to call it a night and clambered into our sleeping bags ready for a good nights sleep. I was cold. I could feel the cold seeping up though my camping mat and into my bones. Why am I so cold I thought! I’m normally so cosy in my nordic sleeping bag suitable for minus conditions! Richard – who seeming to be hot all the time anyway, was snug as a bug. I put on some more layers and gradually went to sleep. I woke up a few times in the night as somehow I’d slid down my mat and was hanging off the end of the platform. I wriggled my way back up and went back to sleep. Woke again when it was light and decided to get up. It was 6.30 am. I hadn’t slept very well at all and felt cold and grumpy. Slipping on my shoes I headed out the door to use the ‘loo with the view’ and was greeted by the most amazing sight. My feelings of coldness and grump slipped away as I saw Lundy Island on the horizon. I walked the short distance to the toilet and as I sat there watched with delight as the birds flew around in the tree above. The sun was shining and it was going to be a beautiful day. A beautiful day to head down to the beach to search for razor clams. We sat outside in the sunshine and ate porridge and drank tea as the whole area around us warmed up. After breakky and a quick wash (cold water tap!) I decided against putting on my bather and thought we’d investigate first. 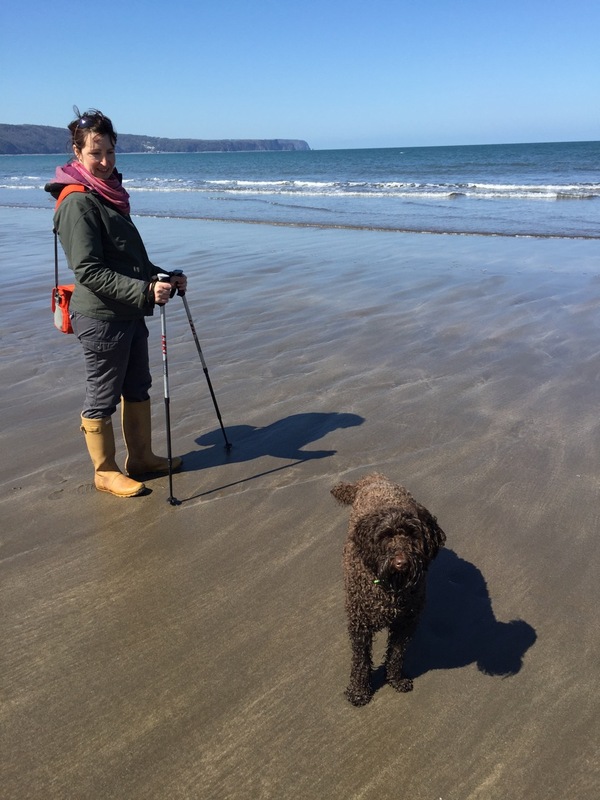 I’d checked the tide times and low tide – when a stretch of sandy beach is uncovered, was from about 13.05. We were already heading down to the beach by 10.30am. Peppercombe beach is flanked by the most amazing cliffs of red sandstone, which apparently are unique to this area. I’d seen a photo of a waterfall on this beach so we set off to find it. 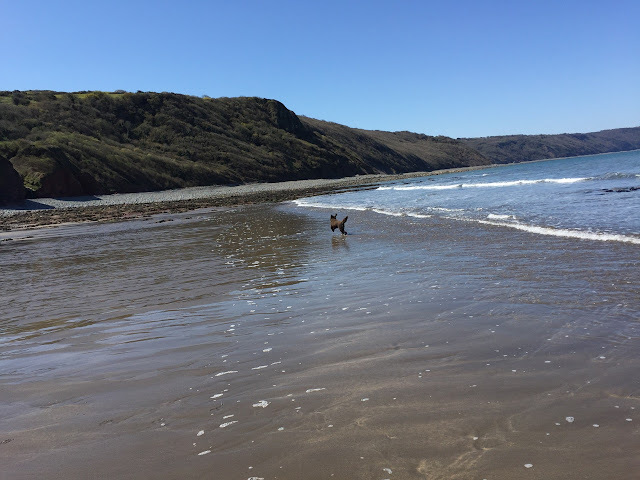 Cerys Puppy seemed to be having the time of her life bounding about on the pebble beach. That’s the benefit of having FPD - Four Paw Drive. I needed both my sticks to navigate over the rocks and it seemed to take a long time to get anywhere. Peppercombe Beach is very pebbly until low tide when stretches of stand are accessible. You still have to clamber over the pebbles to reach the sand though! We found the waterfall and stood for a while looking out to sea at the spectacular view. There is just something about being by the sea that fills me with joy. I’d been past this way last year on my Brecons 2 Morwenstow Adventure but hadn’t made it down to Peppercombe Beach that time. 'Lets head for that patch of sand' said Rich as the tide was already on its way out and a large swathe of sand was becoming visible. Getting to the sand meant climbing over and through (I was super glad I’d opted to wear my wellies rather than my walking boots) loads of rock pools. They were full of bright red anemones and very very small crabs. The limpets that were hanging on to the rocks were some of the biggest I’d ever seen! Once on the sand we started to look for the tell tail signs of razor clams. A small indentation in the sand and a sand cast near by. Nothing so far...we walked and looked as Cerys ran around us clearly enjoying herself. After a while I spotted what looked like razor clam evidence. Look I called – here! Does that look like razor clam evidence? and sure enough he went off and walked in a loop creating the very same ‘sand casts’ I thought were razor clams! so that’s be no then, no clams! We carried on looking but there were none to be found. 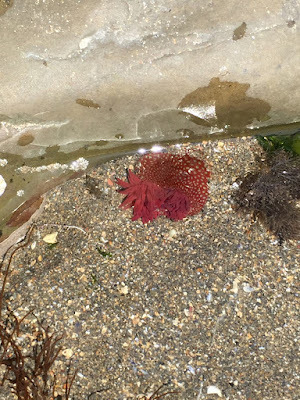 I’d thought clams were to be found on any stretch of coast. Appears not, so we decided we’d head to the pub for lunch instead. We soaked up the sun and I paddled in the sea (still wearing my wellies) before heading back up the path and up to the pub which is a 30 min walk at ‘Mo speed’. We arrived just after they had stopped serving lunch. Typical! We always forget about the ‘lunch serving times!’ We stopped for a pint of their finest beer (which turned out to be called Neet and is by Bude Brewery) we sat in the sunshine watching the cars hurtle past on the A39. Great beer, not such a great view. Dogs aren’t allowed in the bar, you see, so outside it was for us. I’d forgotten what drinking at lunch time does to me so after a very, very nice pint and feeling rather ‘light headed’ we went back down to the bothy to cook some lunch. We chose to cook outside over a fire and it was just perfect. Collecting fire wood – I stayed away from the actual fire making as still slightly woozy! oops, and cooking outdoors. There was some kindling in a bag in the Bothy, I’m guessing left behind by the previous people who stayed (thank you!) and I’d brought some Alfred’s Cakes as keen to try them out. Alfred’s Cakes are a type of fungus that if you let them dry out are great as tinder to start a fire. I’d learnt this on a Mushroom foray we’d been on a few years previously. Ah the fire and the BBQ was super. Rich booked to have dinner at the pub at 18.00 so we could be back at the Bothy for the sunset and a fire (and to get the hipflasks out). The food was good at The Coach and Horses and we had another pint each of the Bude Brewery Neet as it was so good. Richard opted to have the steak and ale pie which looked like it had Lundy island fashioned out of puff pastry on it! It was a good pie he said and my lasagne with garlic bread was tasty. Just what I wanted. Followed (of course) by a very delicious sticky toffee pudding with clotted cream. Everyone at the pub was friendly and its a good little place. Time came to wander back again down the lanes to our Bothy and get a fire going. The sun had disappeared behind some clouds and a wind was starting to pick up so as Richard set about making a good fire – I re-organised the sleeping arrangements with a hope of being warmer. I put more blankets under my sleeping bag over the camping mat and an extra blanket over the top. I hoped that would be enough. I was also planning on sleeping in even more layers than the previous night. Fingers crossed! Richard had a lovely fire going and I brought out the wine and the hip flasks ready to enjoy the sunset. It was a bit too cloudy for anything spectacular and the wind had picked up again sending an icy chill around my neck. I pulled up the hood on my fleece. Put a woolly hat over that then put up the hood on my windbreaker and zipped it all up. I couldn’t move my head to look around me and had to turn my whole body – but boy it was snug! It was just my legs now getting the cold blasts. I’d stupidly not packed my thermal leggings and my bum cheeks were numb with cold. I’d also forgotten gloves and even though Rich offered me his I found another solution. Hiking socks make for good mittens! I didn’t really care I had socks on my hands and I was zipped up like a zipped up thing, I was keeping out the cold. We sat for a while by the fire swigging from our hipflasks like true adventurers but the cold wind got the better of me and I had to retreat inside to the shelter of the Bothy. I was learning a lot about what I should have packed for this trip! That’s what this was though – an adventure, an experience of really going back to basics and seeing what we / I needed to be comfortable, an opportunity to learn what kit I needed next time. I didn’t mind about the cold water tap or the outside loo, or the fact there as no electricity or no wifi. I really enjoyed those elements. It was being cold and not getting enough sleep that I didn’t enjoy. Richard, thankfully was fine which was good. I was quite happy to be able to go into the Bothy and be shielded from the cold bitter wind. I could still see the sea through the small window and was looking forward to the evening drawing in and lighting the candles. The change of sleeping layers worked and I was much warmer although still not quite warm enough. In my mind I was comprising a list of things I’d bring next time....thermal base layers, long johns, sheepskin rugs, hot water bottle, some way of heating the bothy – what was that heater made from a terracotta pot and a tea light I’d seen on facebook that time? a camp blanket - like the one I’d had when I was in guides that was covered in my badges....A lantern of sorts, solar maybe as well as a solar shower...?? I'd packed my solar monkey and that had been brilliant. Being warm was turning out to be the biggest basic need for me. Before we’d set off on this adventure I hadn’t realised that would be the thing I'd miss the most and how that would impact on everything else. Lesson learnt! After a breakfast of beans and half a pasty for me and beans and scrambled egg for Rich, we packed up and loaded the car. I noticed an itch on my hand and realised I’d been bitten so got out the bug repellent. Well actually its Avon Skin So Soft Body Oil as it works a treat at keeping bugs at bay. Well when I remember to use it. I tried to spray some on my hand but the spray didn’t work. I twisted it about a bit and tried again. nothing. ah it must be broken I thought. I got Richard to have a go. Same problem, so he suggested I just open the bottle and dab it on. It was when I unscrewed the lid to pour some out that I noticed it was solid. Yep It was FROZEN. ah ha! so THAT was why I couldn’t spray any out.......! I hope now you aren’t thinking I’m such a cold weather woose! 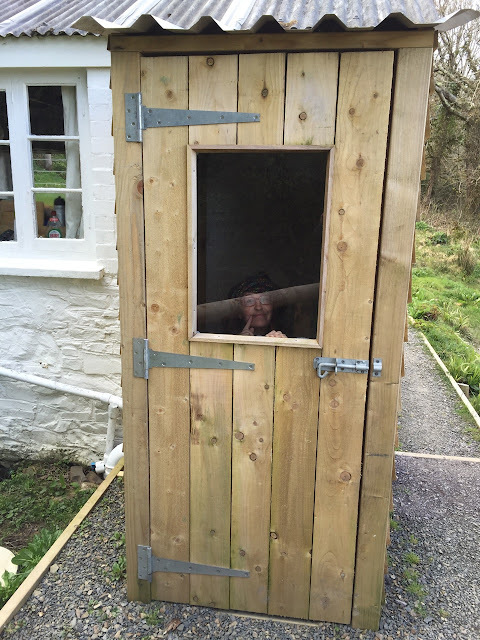 The Loo With A View! 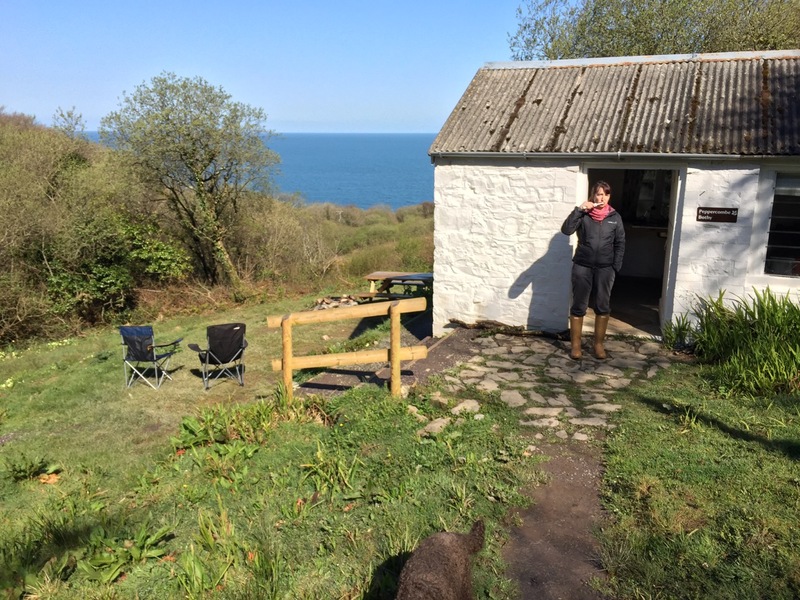 You can hire the Peppercombe Bothy for £20 a night through the National Trust and it’s right near the coastal path. Just make sure you pack enough warm clothing/bedding! I'd like to stay here next time! !